The new Ecotech Marine Vectra Pumps are attracting a lot of attention in the aquarium world recently. This article is devoted to the new and innovative features that Ecotech Marine has packed into it’s new DC controllable pump platform. Let’s start with the basics. First of all, there are 2 pump models to choose from. The M1 which is the smaller of the 2 models is rated at 2000 gph (7,500 lph) with a max head pressure of 21.5′ (6.5m). At full speed the pump will draw 80 watts of power. These are some pretty impressive numbers and for this reason alone many folks will want to retire an existing pump and replace it with a Vectra. (You can always keep the old one as a backup pump.) 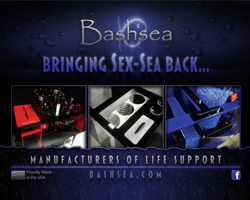 So what can you do with a return pump that you haven’t already thought of? This is where Ecotech Marine has broken the barriers of what a return pump used to be. Below are a list of just some of the reasons we think the Vectra M1 and L1 pumps are going to be in many aquariums across the world in the not too distant future. Performance – The Vectra series pumps are energy efficient and nearly silent. EcoSmart Live (ESL) – All of Ecotech Marine’s pumps, wavemakers and lighting products have wireless capability and wireless access from anywhere in the world via computer, tablet or smartphone device. ESL allows you to set programs and time them across all devices in the Ecotech Marine lineup. If you want to decrease the speed of the Vectra or Vortech at night when your Radion lights begin to dim, you can do so with ESL. 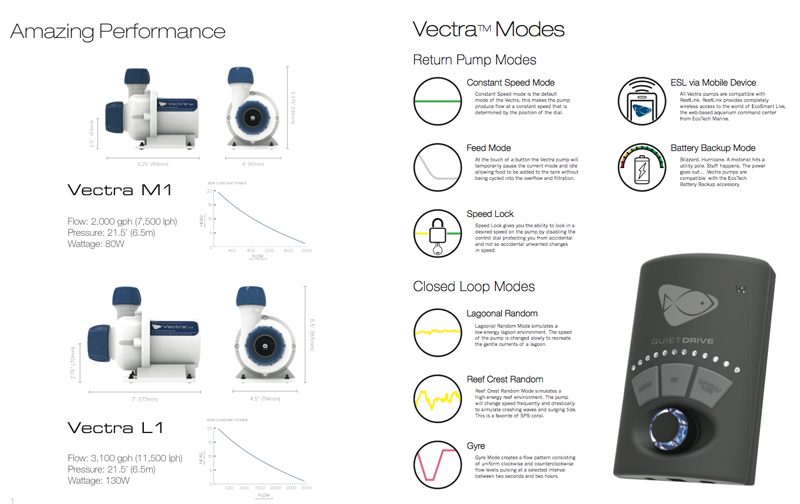 Modes – The Vectra M1 and L1 Pumps feature 2 return pump modes and 3 closed loop modes and a battery backup mode. Below is a chart on the various modes and ESL settings. Active Feedback – Vectra pumps, when used with the ReefLink, can send performance and status alerts straight to your mobile device and computer. Return pumps are vital to the health of your aquarium. Aquarium fish and corals can become oxygen deprived in less than 24 hrs if a return pump dies. Live eliminates worries relating to return pump issues. Using ESL, the Vectra can be programmed with daily schedules to synchronize the Vectra pump with Vortech MP series or QuietDrive pumps allowing you to take full advantage of nutrient transport mode. The Vectra will allow you to cycle more water to your sump and skimmer exactly when detritus has been stirred up into your water column. Flexibility – The pump can be used in-sump (submerged/internally) or it can be used inline (externally). This is not exactly an innovative feature but none the less, worth mentioning. 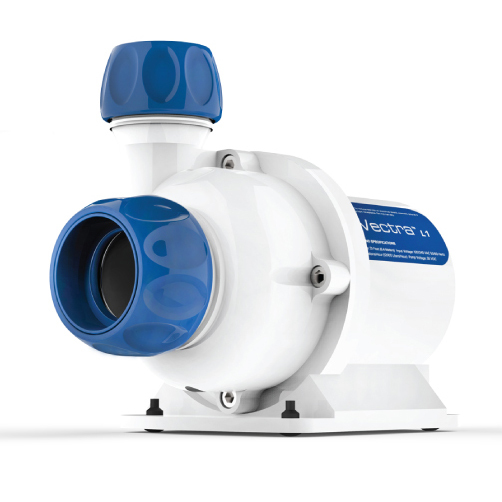 The pumps also come with an adjustable volute which allows the user to rotate the output to 3 different positions. Another nice feature that many pumps lack is the ability to quickly disconnect the pump from the plumbing for servicing. 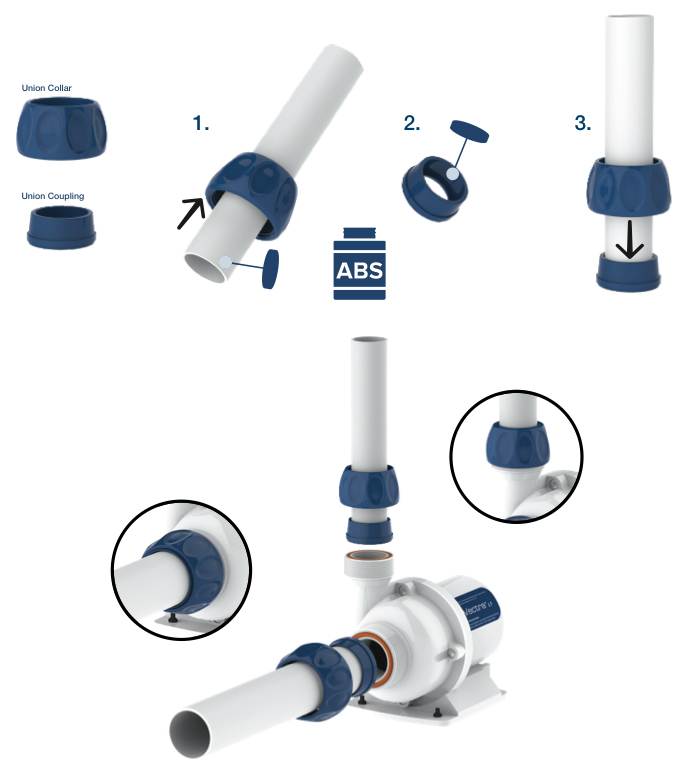 Vectra pumps come with QuickCouple Connectors as shown in the photographs below. Click here for more information on Ecotech Marine and the Vectra M1 and L1 pumps.